A slim ¾" width belt for the little people. 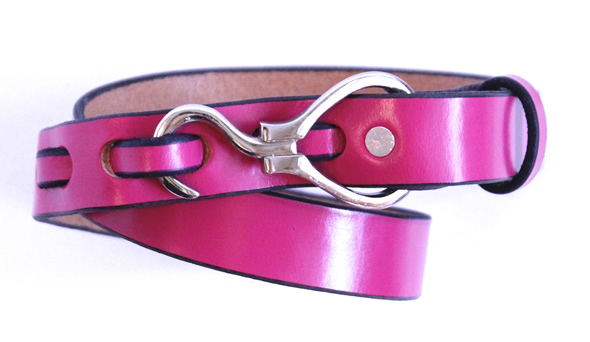 The buckle is an elongated English harness buckle with a gentle curve in the center. Personalize these belts with 3-4 initials included in the price, and make it fun with some of the brighter color options. Solid Brass or Nickel Plated Brass. The Petite Hook is a small version of the our signature hook and is cast locally out of brass and white bronze. Designed for ladies and children, the Petite Hook is made for a 1" strap and we also use a lighter weight leather from the same tannery in England. The result is a well balanced and elegant look. For children's orders we size the belt to the tightest loop allowing for 4.5" of waist growth which usually translates to years. Made to the same exacting standards as the rest of our belts, they are ideal for passing down to younger siblings for years of use.